How to watch 4K video online and on TV | What Hi-Fi? Gone are the days when 4K Ultra HD content was limited to promotional videos of flowers and cityscapes. And good riddance to them. Across streaming, broadcast and Ultra HD Blu-ray formats, there's now enough 4K material to fill a week-long 4K binge (and the rest). Video-on-demand streaming services such as Amazon Prime Video, Netflix, Rakuten and YouTube now offer plenty of 4K films and TV shows. Apple and Google have 4K downloads at fairly affordable prices, while the BBC managed to successfully carry out live 4K broadcasts of the 2018 World Cup and Wimbledon Championships, and is now onto its second on-demand documentary series in 4K on iPlayer. The biggest source of 4K content, especially if you want the very best picture quality, has to go to Ultra HD Blu-ray discs and players, mind you. From dedicated 4K disc-spinners such as the Award-winning Sony UBP-X700 and Panasonic DP-UB9000 to games consoles such as Microsoft's Xbox One S and the Xbox One X, premium and budget Ultra HD Blu-ray players are no longer a pipe dream. We're also seeing more Ultra HD Blu-ray discs going on sale in the UK - now numbering in the hundreds and spanning new and old titles. Some have HDR 10, others have Dolby Vision HDR, and soon we should start seeing some discs with HDR10+ (a Dolby Vision rival) on our shelves. 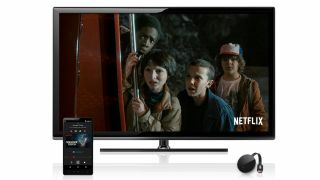 Netflix was one of the first video-on-demand services to announce it would be supporting 4K streaming, and in April 2014 it went live in the UK. But to access the content, you need to have the right kit. To watch Netflix 4K online, your 4K TV will need to support the HEVC (High Efficiency Video Coding)/H.265 compression standard. The first generation of 4K TVs didn't support this - they instead came with the H.264 codec, which doesn't support most of the 4K content now available. If you're trying to watch 4K Netflix via an external source such as an Apple TV 4K or games console, you'll also need to make sure your TV (or other necessary kit) has an HDMI 2.0 connection that is HDCP 2.2 compliant. This ensures copy protection compliance for 4K content coming from an external source. Essentially, if you've bought a TV in the last few years, you should be fine on both fronts. If you have a non-compatible 4K TV, all is not lost - manufacturers can release software updates. Panasonic, for example, has released a software update for its AX802 series (you can read the What Hi-Fi? review of the 58in version), which enables it to stream Netflix in 4K. Alternatively, you can connect a separate streamer, such as the excellent Amazon Fire TV Stick 4K, Apple TV 4K and Now TV Smart Stick to your TV. This gives you access to Netflix (and other services) in 4K. Sky Q has recently integrated Netflix into an Ultimate On Demand offering, too. To watch 4K material on Netflix, you will also need to sign up to the service's Premium 4K Ultra HD plan, which costs £9.99 per month. This subscription plan comes with the added benefit of users being able to watch content on up to four screens at any one time, all from one account. And finally, you need a solid internet connection. Netflix recommends a speed of at least 25Mbps, but ideally higher, for streaming 4K video. Once you've ticked all those boxes, you're ready to start watching. But what content is out there? Mostly, it's Netflix's own Original films, documentaries, stand-up specials and TV shows, of which there's now quite the selection, including the likes of The Crown, Stranger Things, Better Call Saul and Marvel's Daredevil. Amazon is also offering 4K content through its Prime Video streaming service. For those with Prime memberships, a range of Amazon Original TV shows are available at no extra cost. You can watch 4K video through the Amazon Prime Video app on compatible TVs and the aforementioned Fire TV Stick 4K, as well as some other external sources such as the Apple TV 4K. You'll find the necessary Amazon app pre-installed on all the latest TV models from most of the major manufacturers. If you have an older set, you might need to perform a software update. Amazon's service offers a good selection of 4K films and TV shows. You'll find TV shows, including Amazon Originals such as American Gods, The Man in the High Castle, The Grand Tour, Transparent and Red Oaks, all available in 4K and all included in the Prime price. Films available to stream include Jumanji: Welcome to the Jungle, Paddington 2, Blade Runner 2049 and more - all on a pay-as-you-go basis. Rental prices start at £1, though £7 is more standard (and not all films can be rented). To buy, you're looking at between £5 and £14. BBC has been delivering 4K content on its on-demand streaming platform for over a year now, having kicked off proceedings with a snippet of Planet Earth II in 4K in late 2017. It finally progressed to show an entire series - Blue Planet II - in Ultra HD 4K and HLG (Hybrid Log Gamma) and now we're mid-way through its second, Dynasties - so if you haven't caught the series yet, put that near the top of your to-do list. It looks sublime. On both occasions, the David Attenborough-narrated nature documentaries have appeared on iPlayer in 4K just after their live HD broadcast, available to watch in full 4K and HDR for 30 days. Blue Planet II made it to Ultra HD Blu-ray soon after, and Dynasties is slated for a 4K disc release just before Christmas. The BBC has also carried out is first ever live 4K streaming trials on iPlayer. In April, it broadcast an entire rugby league Challenge Cup match and in May, it streamed the second half of the FA Cup Final between Manchester United and Chelsea. But the biggest scoop for the BBC was streaming live 4K broadcasts of the World Cup and the Wimbledon Championships in the summer of 2018. What's more, the Beeb has said it has fixed the overriding lag issues that plagued the otherwise successful broadcast trial, and we can surely hope to see more live events in 4K soon. BBC 4K HDR iPlayer: after Wimbledon and the World Cup, where next? YouTube has been supporting 4K Ultra HD video since 2010 but, as with the two previous services here, there are requirements. YouTube Ultra HD videos don't use H.265 compression. Instead, they use the VP9 codec, which is royalty-free, meaning its adoption rate could potentially be higher. It is also said to be more efficient when it comes to streaming Ultra HD video. So how do you watch 4K YouTube videos online? Google implemented the VP9 codec into its Chrome browser and YouTube in 2013, so both have been able to support 4K streams for some time. If you search 4K content within YouTube right now, you'll be able to select 4K as a quality option on each video. But, as with HEVC/H.265, VP9 needs compatible hardware (ie. a 4K screen) to watch it on. Most new PCs should support the VP9 codec, but it's something to keep an eye out for. If you don't have a compatible display, the video will be downscaled to the maximum output of your monitor. Apple rather belatedly joined in on the 4K fun, finally launching its first 4K- and HDR-supporting Apple TV 4K box in September 2017. Plug it into your 4K TV, and it will give you access to a wide range of 4K content via Netflix, YouTube and Amazon Prime Video. But what makes Apple’s proposition unique is access to its iTunes library – which now includes a wealth of titles in 4K and HDR (along with Dolby Vision and Dolby Atmos, too). There are over 200 4K films available to buy or rent on iTunes at the time of writing, including recent blockbusters such as Mission Impossible: Fallout, Deadpool 2 and A Quiet Place, which are otherwise only available in 4K via Blu-ray. What's more, Apple charges the same price for 4K films as it does for HD films (typically £13.99, sometimes as low as £9.99 when buying, and much lower still when renting), which is a huge step forward for fans of 4K. It's in sharp contrast to the price of 4K Blu-ray discs (usually over £20) and the premium charged for 4K Netflix, too. And if you’ve already bought a film from iTunes that’s now available on the store in 4K? You automatically get the new version at no extra cost. All of which is good news for those who want more 4K content. You will need to sign up for an iTunes account (which is free) and get the new Apple TV 4K box (which isn’t cheap at £179), but it’s a decent start if you want one of the best and most affordable 4K HDR movie streaming libraries currently available in the UK. Where else can you watch 4K video? If you're more of an Android fan than Apple, then you'll be pleased to know the Google Play Store now offers 4K content for download and streaming, including to TVs that run the Android operating system, such as most of those launched by Sony and Philips over the last couple of years. HDR does appear to be missing from these 4K movies, though, despite logos suggesting it's there. UltraFlix meanwhile is a 4K streaming network from NanoTech, and has apps on Samsung, Sony, Vizio, Sharp and Hisense TVs. The 4K UltraFlix Network App claims to offer the "world's largest library of 4K VOD content", including "hours of free content" from movies, concerts, documentaries and special events to 40 made-for-IMAX theatrical titles. Rakuten is another service that offers Ultra HD 4K content for streaming. However, according to the Rakuten website, it's only compatible with 4K Samsung smart TVs running a Tizen operating system (2015 models and newer, and models higher than JS6000) and 4K LG smart TVs with WebOS (2016 models and newer). The company recommends a minimum internet connection of 20Mbps. Rakuten recently announced a partnership between itself, LG and Dolby to bring Dolby Vision (and Atmos) movies to its film rental service. It also announced that it will upgrade already-purchased Full HD films to 4K HDR for free, where available. What about watching 4K TV broadcasts? BT became the first broadcaster to bring an Ultra HD channel to the UK, with the launch of BT Sport Ultra HD in August 2015. The focus is primarily on football, but it has also shown other events including the MotoGP, NBA basketball and Aviva Premiership rugby. The channel is supported by the majority of 4K TVs released from 2014/15 onwards, but you will need to subscribe to the Ultra HD package, have an Infinity Fibre broadband connection and get the new BT Ultra HD box fitted. Sky claimed it would offer the "UK's most comprehensive Ultra High Definition service" through its Sky Q platform in summer 2016, and it certainly stuck to that promise. Sky Q Ultra HD launched in August 2016, with a wide range of content available at no extra cost to Sky Q subscribers (provided you subscribe to the relevant TV package). While football again features heavily, there are also movies and TV shows, Formula 1 races, test cricket and some boxing matches. Sky is also set to double its 4K offering soon, and HDR support should arrive in early 2019. You'll need a Sky Q 2TB box (known as the Sky Q Silver box when it launched), as well as a subscription to Sky Q Multiscreen. Eurosport launched a 4K Ultra HD channel especially for its coverage of the 2018 French Open from Roland Garros in May 2018. You'll need either a Sky Q 2TB or Virgin TV V6 set-top box and a relevant subscription package to view it. And Virgin TV has now finally launched its own 4K entertainment channel. While it offered Champions League and Wimbledon matches this summer, the Virgin TV Ultra HD marks its first channel dedicated to 4K content. It's available for Virgin TV Full House and VIP customers with a V6 set-top box. What about 4K on terrestrial TV? All of BBC's 4K trials (Blue Planet II, Dynasties, 2018 World Cup and Wimbledon) have all taken place on its internet-hosted iPlayer platform, and it looks like it will carry on with its 'internet first' approach. There's been no word from ITV or Channel 4 in the 4K stakes yet (despite ITV hosting plenty of 2018 World Cup matches), either, so it looks like the Beeb leads the way - so far - when it comes to 4K broadcasts. Will there ever be a 4K channel on free-to-air broadcast TV? We will have to wait and see. What about 4K on PlayStation or Xbox? Sony has its own 4K Video On Demand service, which is part of the company's PlayStation Video platform. The service includes 4K content, but only in the US. To access 4K content, you need one of the selected US Sony 4K TVs or one of Sony's 4K Media Players, such as the FMP-X1. Films range from $8 for a 24-hour rental to $30 to buy. Sony says it has "no plans" to bring the 4K Media Player to the UK. Sony's PS4 Pro is equipped for playing 4K games, but it doesn't have an Ultra HD Blu-ray drive. Sony has also launched an Ultra app, which brings 4K videos to selected Sony Android 4K TVs. Again, it's only available in the US for now. The Xbox One X boasts similar 4K functionality to the One S in a more powerful package. It can also render 4K games natively. During testing we felt the 4K Blu-ray performance of the One X was superior to its sibling. For many, getting a broadband connection that's fast enough to support 4K streaming (realistically 15Mbps at the very least) isn't possible right now. Therefore a better way to get 4K content into the home is via disc. The good news is Ultra HD Blu-ray is here. After a slow start, there are now over 500 titles (new and old) available in 4K. Discs that can handle resolutions up to 3840 x 2160 and up to 60fps (frames per second) are classed as Ultra HD, and the format also supports high dynamic range (HDR) and object-based immersive sound such as Dolby Atmos and DTS:X. Right now, HDR on 4K Blu-ray discs appears in two varieties: HDR10 and Dolby Vision. Video is encoded using the High Efficiency Video Coding (HEVC) standard, and includes 10-bit colour depth and the Rec. 2020 colour space. As we mentioned earlier, HDR10+ Ultra HD Blu-rays are on the horizon, too. You will, of course, need a new Ultra HD Blu-ray player to play the discs. We've tested more than a few, including five-star standouts the Sony UBP-X800, Cambridge CXUHD and Panasonic DMP-UB900. Still not satisfied? You could always create your own 4K Ultra HD content. Most flagship smartphones these days, including those from Apple and Samsung, record 4K video, meaning you can make your own 4K movies in no time. Good news for budding amateur filmmakers: Qualcomm (who is behind the processor chips in several smartphones) has just announced its Snapdragon 855 mobile platform, which supposedly facilitates 'better than ever' 4K HDR recording (and in portrait mode for the first time) and supports HDR10+. And of course there are also plenty of 4K cameras available. The growth of 4K content means the format is becoming an increasingly tempting proposition. The amount of content available to stream is rising all the time and, while it relies on a high-speed internet connection, it offers the most extensive catalogue. 4K Blu-ray discs are here too, and from what we've seen they offer superior audio and video performance to streaming. As expected, the trickle of available titles is fast becoming a flood. As for 4K TV broadcasts, things are starting to move in the right direction. Now that Sky, BT and Virgin are broadcasting in the format, and the BBC has taken 4K to iPlayer, interest is bound to increase. The main obstacles are the cost and logistics of a steady, fast 4K stream. 4K TVs are becoming more affordable, but Sky and BT's services aren't cheap, and broadband speeds vary from region to region, household to household. On the bright side, it's now more viable than ever to put a 4K TV in your home. And there's finally something - in fact, a lot of things - to watch on it. We can only hope the early 8K TV hoo-ha speeds up 4K availability and accessibility, too.